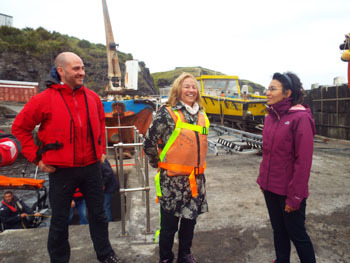 Report and photos of the visit of the RMS St Helena to the Tristan Islands on 19th-20th April 2016, including the visit of the new Governor Designate. for what turned out to be a very short visit. to a windy, rainy Tristan. 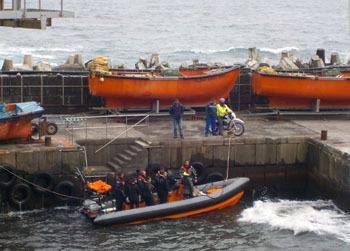 as she headed off to the Outer Islands. and its getting worse with gales predicted until next week. An RMS St Helena visit is always an eventful time for the island; none more so than their final voyage. 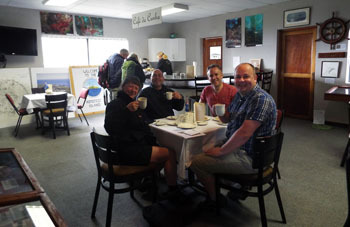 On the morning of Tuesday 19th April morning the RMS hoved into view through heavy rain and stormy seas...and kept going! 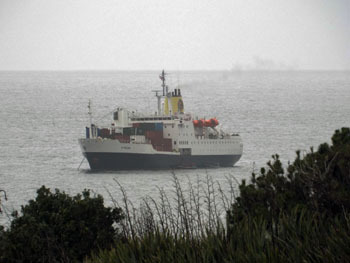 While it was lovely to see the vessel again, it was very disappointing to see it pass by – perhaps for the last time. 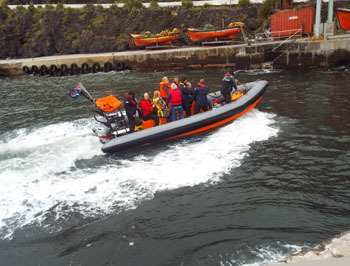 However poor weather conditions could not defeat this trip. 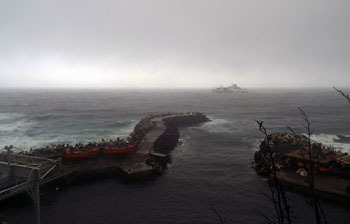 The RMS decided to sail across to Inaccessible Island, and quite literally weather out the storm and try again the next day. Thankfully the weather system passed and early Wednesday morning we set out from Calshot Harbour. 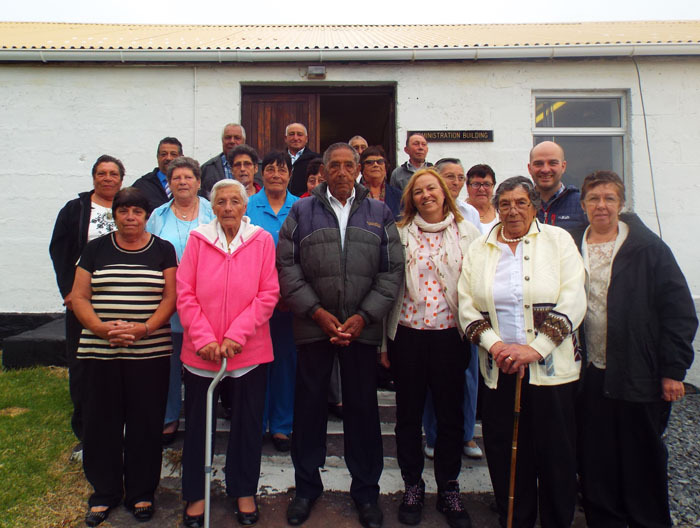 to greet RMS St Helena passengers on the ship's last visit to Tristan da Cunha on 20th April 2016. 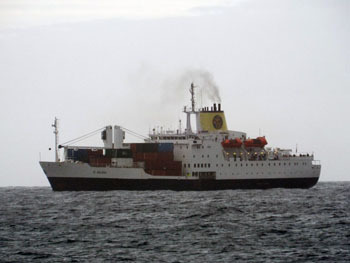 Below: Views of the RMS St Helena. Ian Lavarello, Samantha and Emma Swain and I boarded the RMS at 08.30 in ‘bumpy’ seas to greet Lisa Phillips, Governor Designate. 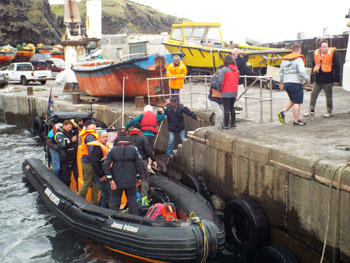 After waiting for the swell to ease, the RMS gave the order that everyone had been hoping for – it was now safe to go ashore, and from 10.00 a steady flow of (very) relieved passengers set foot on Tristan da Cunha. 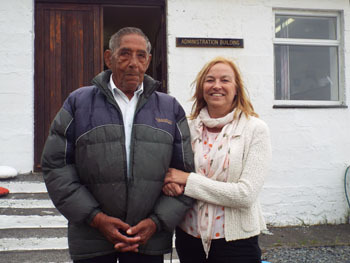 Lisa Phillips, Governor Designate and Alex Cameron from the FCO came across initially and were greeted by the Island Council and were able to spend several hours discussing Island matters. The Governor Designate was also able to meet a number of pensioners including Ernest Repetto who was celebrating his 90th Birthday! Above left: Pensioners Tea Party in the Council Chamber; Above right Governor Designate Lisa Phillips with Ernie Repetto on his 90th birthday. Below: Lisa Phillips and Alex Cameron with pensioners outside the Government Building. 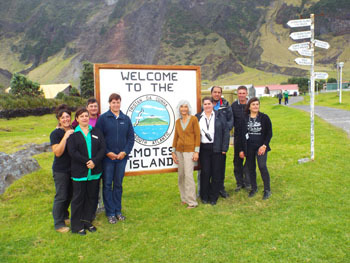 After the meetings, Lisa and Alex went on a tour of the settlement plain including the village, Potato Patches, bluff and 1961 Volcano. 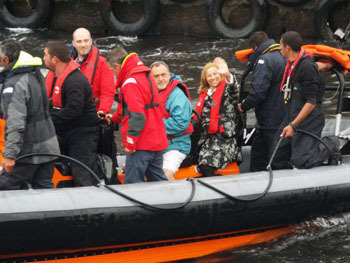 The Governor Designate and Alex returned to the RMS at 17.00. While it was a short visit, I hope it gave them a flavour of the island, the people and culture. 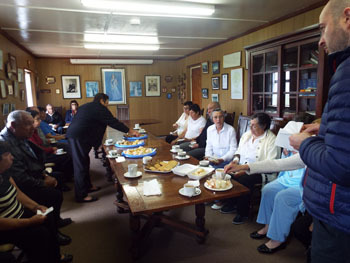 Above: A special reunion as St Helenian Joy George (centre in light trousers) meets with islander who are former pupils at Prince Andrew School on St Helena. 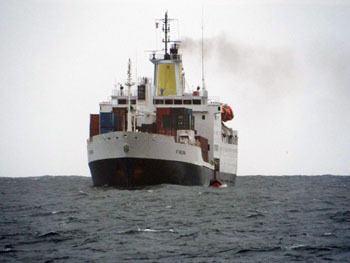 The annual visit of the RMS St Helena between 1985 - 2004 provided a direct annual link. Occasional cruises since have been mainly full of tourists. 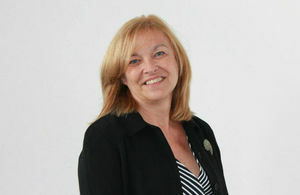 The islanders present include Shirley Squibb, Natasha Glass Geraldine Repetto and Tanya Green, Warren Glass, Nicky Swain, Samantha Swain and Dawn Repetto. All spent two years at Prince Andrew School on St Helena. with a poster for Tristan Island Brew. 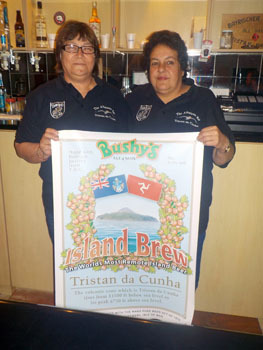 Aboard the RMS was Martin Brunnschweiler and his wife Debbie from Bushy's Brewery on the Isle of Man who brewed the 'Island Brew'. 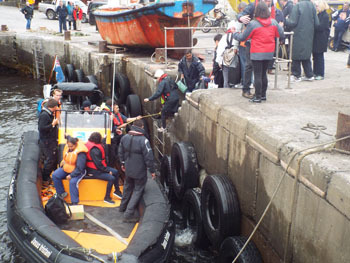 RMS Passengers depart: Above scenes in Calshot Harbour as the last ever RMS St Helena passengers depart Tristan da Cunha - in the right photo Governor Designate Lisa Phillips is waving. 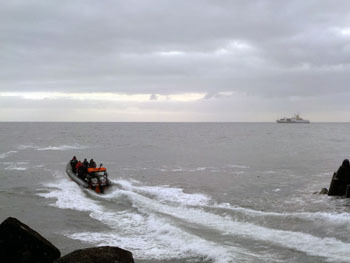 Below: The final RIB departs Calshot Harbour to the awaiting RMS St Helena. 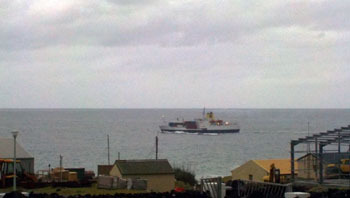 Final views from Tristan da Cunha of the RMS St Helena as the ship departs for St Helena. Alex's Mitham's report continues as the community's sad farewell turns to the RMS turns into a celebration.. The RMS set sail for St Helena at 18.00, a day early, as unfortunately another weather system had started to barrel in from the west. While it was disappointing to see the RMS disappear over the horizon, the island still held a community reception at Prince Phillip Hall, to not only recognise and celebrate the final voyage of the RMS, but just as importantly Her Majesty the Queens 90th Birthday and the islands 200th Anniversary. At 20.00 the Island Council lit a beacon on the 61 Volcano in Her Majesty’s honour, singing Happy Birthday and the National Anthem. A small fireworks display was also lit in the Island's honour. It was a hectic day for Tristan. The community had to try and shoehorn in three days of events into just a few hours. 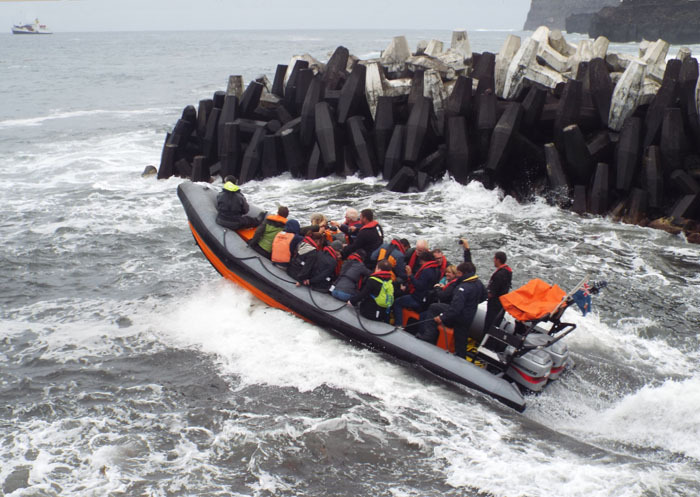 But I know all the passengers who came ashore enjoyed themselves, were able to meet up with family and friends and spend a few precious hours on the remotest inhabited island in the world. 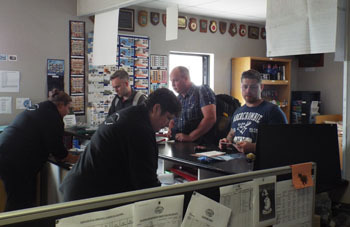 The whole community thanks the RMS St Helena for visiting Tristan and wishes the Governor Designate, RMS, crew and passengers a safe, enjoyable and successful onwards voyage. I would also like to thank the community for all their hard work over several weeks. 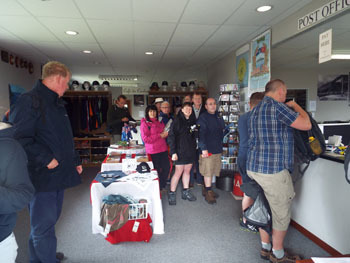 It took a great deal of time and effort into arranging the visit, and while short - it was very successful. So thank you one and all. See the separate Community Party page for more about the Queen's 90th Birthday and 200th Anniversary celebration.